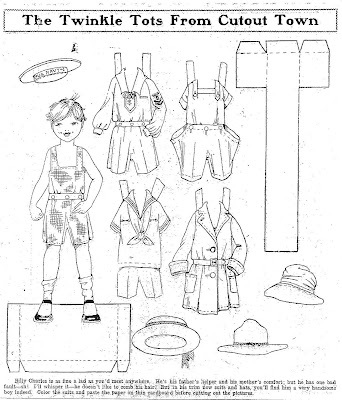 I decided I needed a boy paper doll to go with "The Yearling" coloring contest. This is Billy Charles, a Twinkle Tot from Cutout Town. He appeared in newspapers in April of 1929. 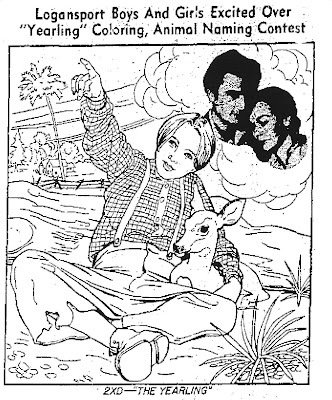 This newspaper coloring contest for the movie "The Yearling" appeared in papers in June of 1947. 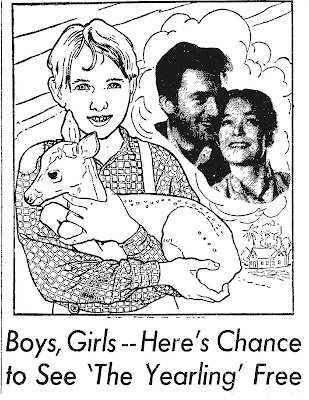 The movie starred Gregory Peck, Jane Wyman and Claude Jarman, Jr. 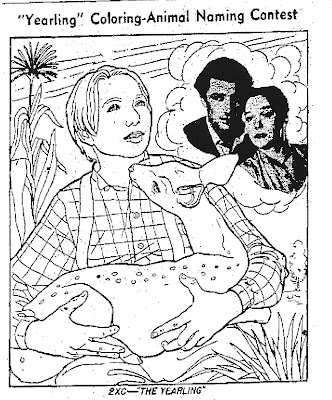 The movie was based on the novel "The Yearling" by Marjorie Kinnan Rawling. Terrific novel and terrific movie - pass the tissues. 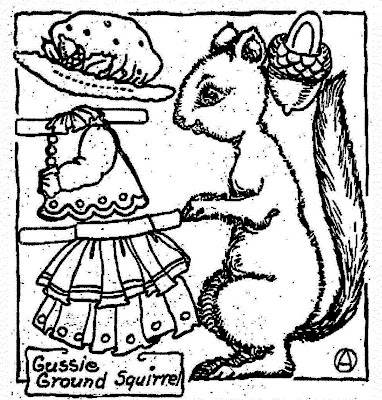 "Gussie Ground Squirrel" paper doll was published in the Aunt Elsie "Merry Makings" page of the Olean Herald on September 08, 1922. I love this book. 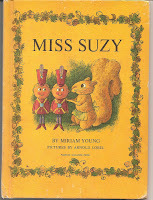 "Miss Suzy" by Miriam Young and illustrated by Arnold Lobel was published by Parents' Magazine Press in 1964. After a hard day of sunbathing, Boots needs to relax and chat on the phone with friends. 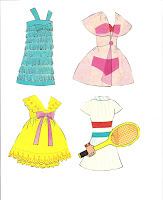 These newspaper paper dolls are from the Sunday comics of 1951. Many thanks to Edgar Martin. 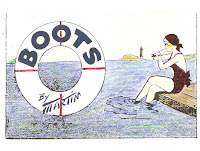 BOOTSDAY - This "Boots" newspaper paper doll appeared in weekday newspapers in March of 1935. 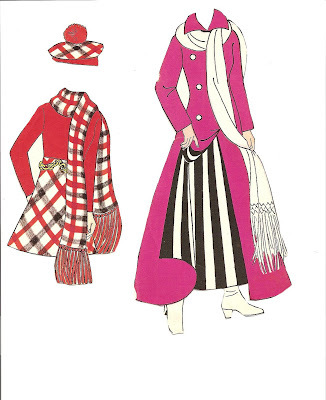 ELIZABETH ANN, another addition to the Laura Brock Paper Doll Family that appeared in newspapers in 1933 and 1934. Elizabeth Ann was published in August of 1933. 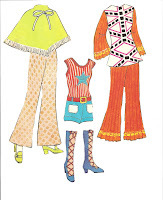 ETTA KETT paper dolls that appeared in the Sunday comics. 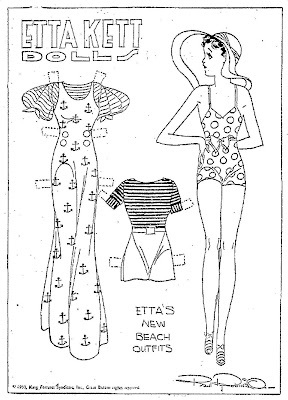 Etta and her new beach outfits are from 04 June 1933, and Etta and her dee-vine party frocks are from 23 July 1933. "Marjorie Visits Annabelle" appeared in the Sunday comics section of various newspapers on December 11, 1926. 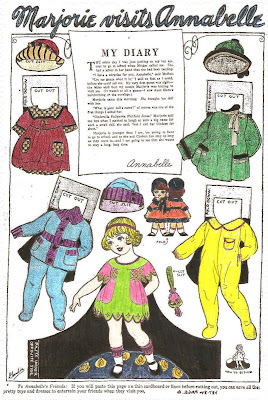 "Annabelle" was a newspaper paper doll series that ran in the Sunday comics section of newspapers from 1925 to 1926 and probably other years. 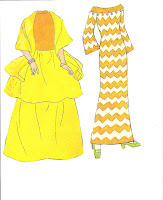 More clothes for my Dawn paper doll. 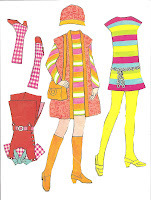 Here is my Dawn paper doll by the Topper Corporation in 1971. Dawn is so Cooool! 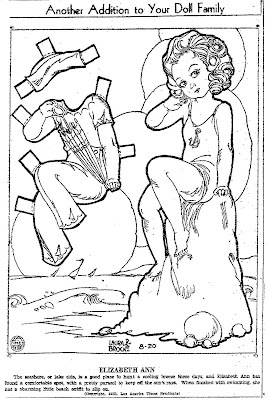 This BOOTS paper doll is from a week-day newspaper in 1937. 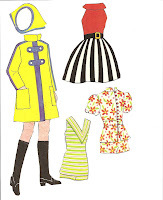 The paper dolls that ran in the week-days newspapers were in black and white unlike the Sunday comics paper dolls. Many thanks to Edgar Martin for his creation. Today is BOOTSDAY! 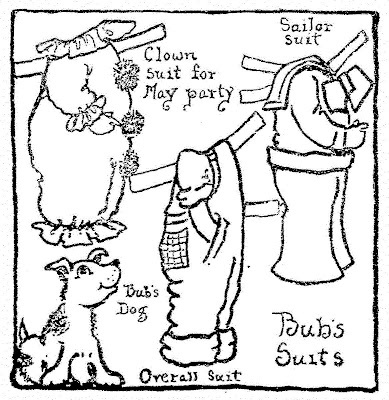 These BOOTS paper dolls are from the Sunday comics in 1938. 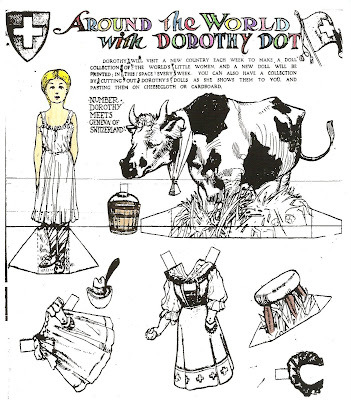 "Around the World With Dorothy Dot" was a popular childerns book series. 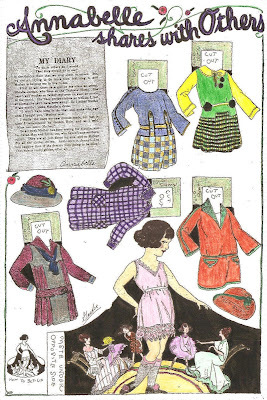 A newspaper paper doll series based on the books appeared in the Sunday comics of various newspapers in 1909 and 1910. 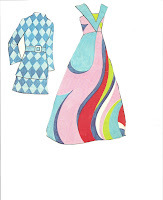 This paper doll is Geneva of Switzerland. 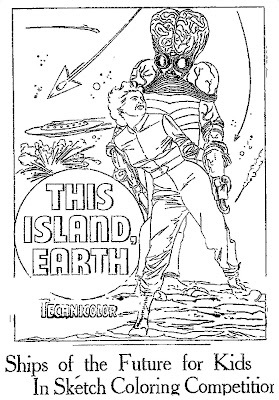 "This Island Earth" starred Jeff Morrow, Rex Reason, Faith Domerque, Russell Johnson, Lance Fuller and Douglas Spencer - I have never heard of any of these people. The movie is based on the novel by Raymond F. Jones. Leonard Maltin gave the movie 3-stars. 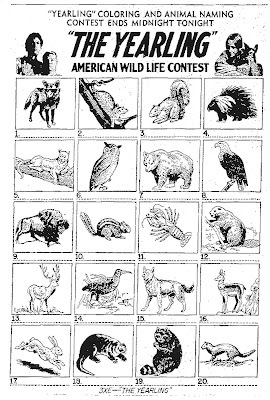 The coloring contest appeared in newspapers in June of 1955. 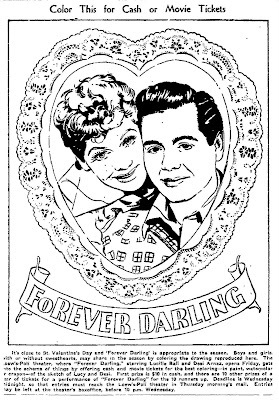 A 1956 newspaper coloring contest for "Forever Darling" starring Lucille Ball and Desi Arnaz. 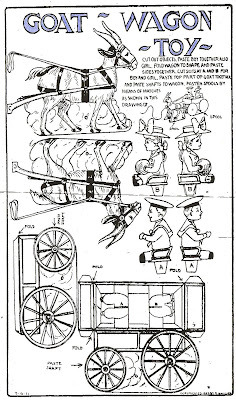 The "Goat-Wagon Toy" was a cut-out for children from the Sunday comics section of various newspapers in September 1909. 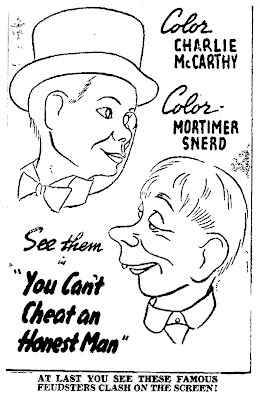 A coloring contest for the movie "You Can't Cheat An Honest Man". The movie starred W. C. Fields, Edgar Bergen, Constance Moore, Eddie "Rochester" Anderson and Charlie McCarthy and Mortimer Snerd. The coloring contest ran in various newspapers in March of 1939 and the winners received tickets to the movie. 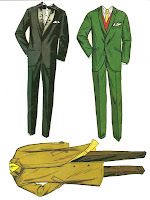 OLIVER WENDELL DOUGLAS Paper Doll from "Green Acres"
My Oliver Wendell Douglas paper doll from the television series "Green Acres". 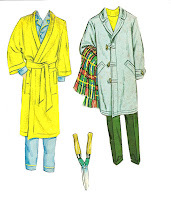 If my paper doll sets came with male paper dolls I would usually set them aside and never play with them. 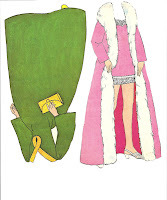 I liked Oliver and I actually played with this paper doll. 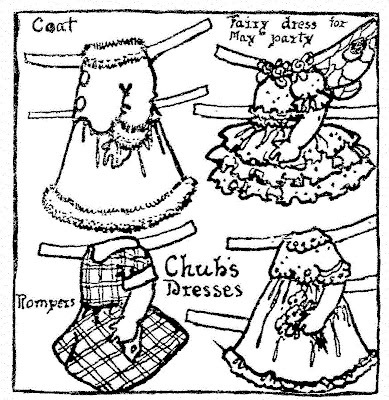 Bub and Chub are newspaper paper dolls that appeared in "Aunt Elsie", a page for children in the Oakland Tribune, on May 09, 1920. 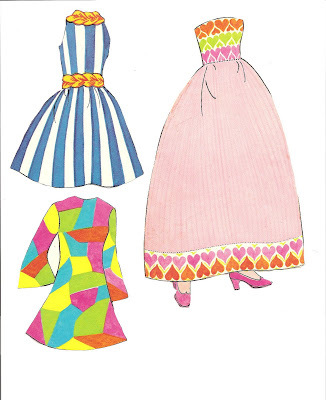 My Grandma Helm was a quilter and these paper dolls remind me of the Sunbonnet Kids quilt pattern. 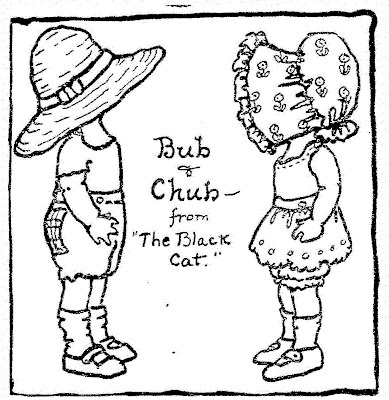 Bub and Chub are from "The Black Cat" - I do not know this story. 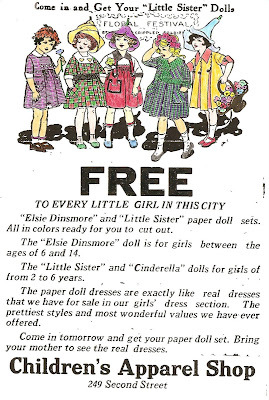 The Elsie Dinsmore paper doll ad for Wolf-Dessauer appeared in the February 13, 1916 edition of The Fort Wayne Journal Gazette. 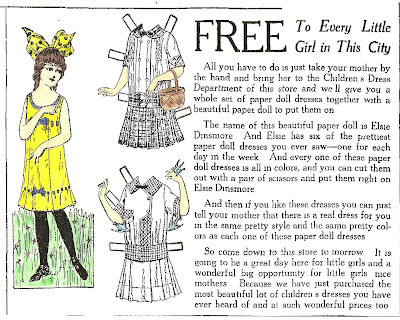 The ad for free paper dolls from Children's Apparel Shop appeared in the March 18, 1919 edition of the Evening Telegram. 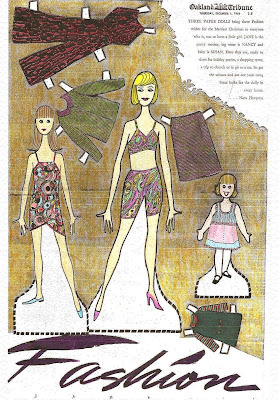 The December 01, 1966 Oakland Tribune ran a two-page ad featuring paper dolls with clothes available from advertisers. Every Wednesday will be BOOTS day - she is my fav. BOOTS loves the great outdoors and here she is water skiing on March 29, 1953. 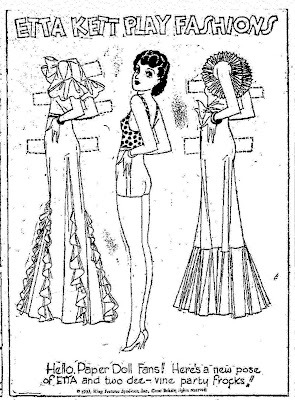 The second BOOTS paper doll appeared in newspapers on May 15, 1938. PAUL ROBINSON, Creator of "Etta Kett"